David Daniel Bowes, violist and PBO's Music Librarian, and his partner Brian Haley took a road trip through California and Oregon to visit with friends and "explore the wilds of second-hand shopping without sales tax." 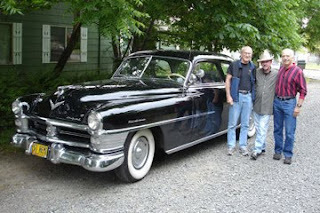 Highlights from the belated honeymoon (they were married last November) included a night spent in a refurbished Santa Fe Railroad caboose at Railroad Motel near Dunsmuir and a day of Sunday driving three beautifully maintained cars from the late 40s and early 50s around Eugene (pictured left). An avid gardner, David plans on having a "jam session" with PBO violist Maria Caswell to learn how to make jams and jellies from his abundant harvests of blackberries, peaches and more. He has also been working like mad to acquire sheet music for all seven of PBO's concerts. This August and September, Stephen Schultz, flutist, will be playing with Tafelmusik Baroque Orchestra at the Reate Festival in Rieti, Italy, and the Klang und Raum (Sound and Space) Festival in Irsee, Germany. He recently released Rameau: Pièces de clavecin en concert on Reference Recordings with Ensemble Baroque Nouveau along with his PBO colleagues Anthony Martin, Charles Sherman and Josh Lee. Stephen was just reappointed as Associate Teaching Professor in Music History and Flute at Carnegie Mellon University in Pittsburgh and he will debut there a newly commissioned piece written by Nancy Galbraith entitled “Other Sun” in November. Check out his new video made in support of his CD, Boismortier: Concertos for Five Flutes. 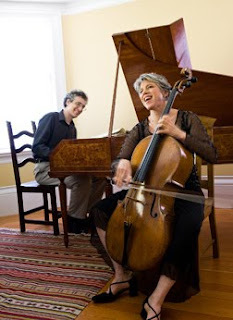 Cellist Tanya Tomkins (pictured left with frequent collaborator Eric Zivian) began her summer teaching at the San Francisco Early Music Society Music Discovery Workshop at Sonoma State. While there, she saw the new Green Center, which she described as "one of the most beautiful venues I've ever seen!" She then went to the Oregon Bach Festival and performed all six Brandenburg Concertos under the direction of Monica Huggett. This was a first for the festival – historically informed performance on original instruments – and it was a big success. Tanya played modern cello with Smetana Trio and taught a master class at the American Music Teachers Association Conference in Santa Clara. She also played the Olympic Festival and a solo concert at the Crocker Art Museum, and, of course, she's not done yet with appearances at the Music in the Vineyards and Moab Music Festival coming up. Strings player Farley Pearce also taught at the a San Francisco Early Music Society Music Discovery Workshop in June. He is also involved in a Clerembeau cantata recording project, has been playing with the Pocket Opera and the San Francisco Opera Merola orchestra, and coached the California Youth Orchestra cellists in Palo Alto. Douglas Yeo, who joins PBO when we need some of the odder brass instruments played – like the ophicleide used in last February's concerts, recently completed a six month sabbatical from the Boston Symphony Orchestra, where he plays bass trombone. 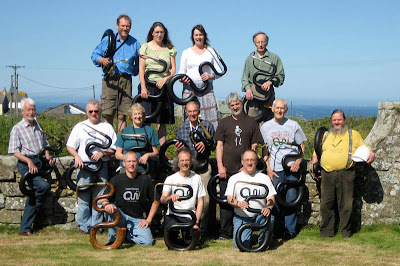 During that time, he engaged in several events revolving around the serpent: the biennial "Serpentarium" in Cape Cornwall, UK (see picture below), a recording session on several serpents and related instruments for the Bate Collection's forthcoming audio guide, and a DVD project entitled "Approaching the Serpent: An Historical and Pedagogical Overview."